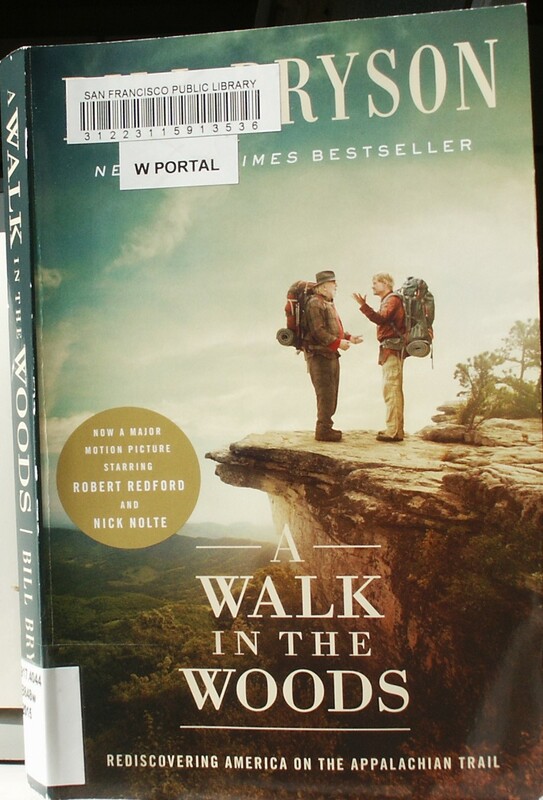 In this autobiographical book Bill Bryson chronicles his hikes on the Appalachian Trail with Katz, a friend he hasn’t seen in twenty years. The two of them start off in Georgia with a goal of hiking 2,200 miles to the other end of the trail in Maine. It combines adventure and humor with digressions into history, ecology, botany, zoology, and geology. The characters Bill and Katz, along with the people they meet on the trail are fully fleshed out and vividly presented. Some life lessons are gained from the trail and at the end of the hike Bill and Katz are in a different place metaphorically as well as physically. The movie, coming out in days, makes some changes in the story. For one, in the book Bill and Katz are in their 40’s, and in the movie they’re an improbable 70 something. The trailer for the movie contains a lot of broad humor which is quite a bit different from the wittiness of the book. Having hiked sections of the trail myself, I was attracted to the book. It was captivating from the first page. Although the book is written primarily to entertain, it’s not without meaningful themes and interesting information. This is the story of Aaliya Saleh, a 72-year-old, socially isolated woman living in Beirut. Throughout her life she has been unappreciated and marginalized; first as an unloved daughter, later as an unloved wife, and ultimately as a divorced woman in a society where divorced women are generally looked down on. The time span is from the early 20th century up to the near present including the period of the Lebanese Civil War from 1975 to 1990. In spite of being “plucked out of school” at sixteen for an arranged marriage, Aaliya educates herself through constant reading, achieving a remarkable degree of expertise in liberal and fine arts. Her husband leaves her after a miserable four years and she sees herself as “superfluous”and an “unnecessary appendage” from which the title is derived. She is befriended by Hannah who is seeking to create her own value or “necessary” status through the service to others. Aaliya begins a lifelong hobby of translating novels into Arabic from English and French translations of works originally in a third language. Her reading and translation work becomes her refuge in life. Through Hannah, Aaliya gets a job at a boutique bookstore. After years of an intimate friendship between Aaliya and Hannah, Hannah becomes depressed (by discovering her late boyfriend didn’t really love her) and commits suicide. Aaliya’s only other friend, Ahmad, is a young man who gets caught up in the war and becomes an interrogator/torturer. Towards the end of the story, Aaliya’s 37 unpublished translation manuscripts come into peril and with some irony, the endangerment of her literary work serves as a catalyst to reconnect her with humanity and fosters a change in her outlook. The author concludes the book in an open way that allows the reader to ponder the questions raised in the book, rather than be given clear- cut answers. 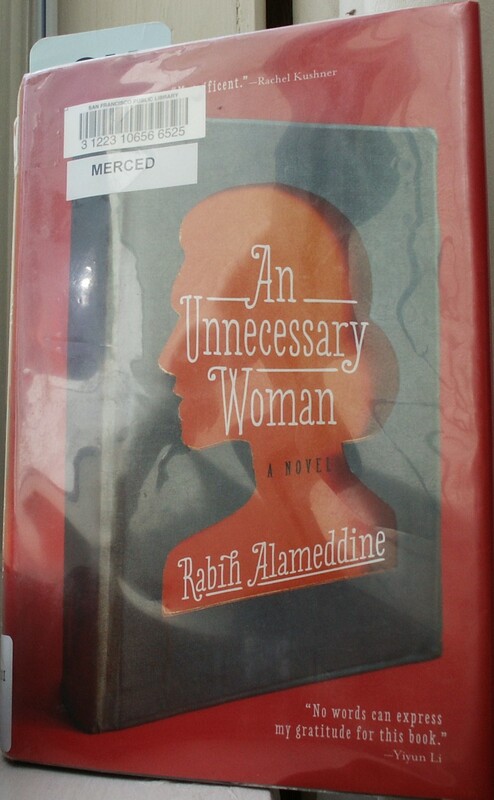 “An Unnecessary Woman” explores several themes: the worth of an individual according to others, self-worth, aging, isolation, alienation, the second class status of women, the value of literature and art, and civilian suffering in war. Throughout the book, Rabih Alameddine references a large number of literary works and figures as well as philosophers, artists, and musicians. In our discussion meeting we all agreed we liked the book. Valerie, our head librarian, has met the author on several occasions and related stories about his artwork, wit, and previous novels. He resides part-time in San Francisco. We were all impressed with the quality of writing and numerous phrases that hit home throughout the book.